December 17, 2018. 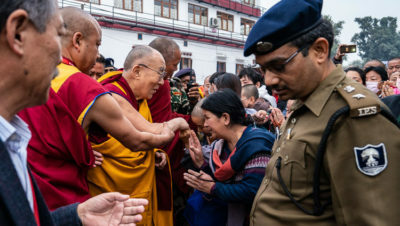 Bodhgaya, Bihar, India – On arrival in Bodhgaya yesterday, His Holiness the Dalai Lama was given a brief formal welcome at the Main Tibetan Monastery, Gaden Phelgyeling. This morning he chose, as a priority, to make a pilgrimage to the Mahabodhi Temple. He also decided to walk, which he did at a brisk pace, greeting friends and well-wishers lining the street on the way. His Holiness was welcomed at the gate to the temple by Bodhgaya Temple Management Committee Secretary (BTMC) Nangzey Dorje, Divisional Commissioner, Magadh, Tenzin Nima Bindhyeshwari, Senior Superintendent of Police, Rajiv Mishra and District Magistrate, Abhishek Singh. They accompanied him into the complex. Once inside, His Holiness paused to salute the Vajra-asana, the Seat of Enlightenment, beneath the Bodhi Tree, with the Mahabodhi Temple behind it. Monks, nuns and lay devotees attending a Kagyu Monlam turned to greet him as he descended the stairs. His Holiness walked the inner circumambulatory path, smiling and waving to people gathered beyond the stone railings that are reputed to have originally been erected by Nagarjuna to protect the Bodhi Tree from elephants. Reaching the temple entrance he paused to pay his respects. Within the inner sanctum, he lit a lamp before the celebrated statue of Buddha Shakyamuni prior to sitting down in front of it. Indian monks belonging to the BTMC first recited the Mangala Sutta in Pali. His Holiness then joined the Abbot and Löbpön of Namgyal Monastery, Thamtog Rinpoché and Ngawang Topgyal, in reciting the Praise to the Buddha known as the ‘Three Continuums’, the ‘Heart Sutra’, Tsongkhapa’s ‘Praise to the Buddha for Teaching Dependent Arising’, the ‘Drumbeat of Truth’, the ‘Praise to the 17 Masters of Nalanda’, a ‘Prayer for the Ecumenical Spread of the Buddha’s Teachings’ and dedication prayers. As His Holiness left the Temple, members of the press were eager to question him. He gave them a succinct summary of what the Buddha taught—advising his followers to observe ‘ahimsa’ or non-violence in their conduct, ‘karuna’ or compassion as their motivation and dependent arising as their view of reality.